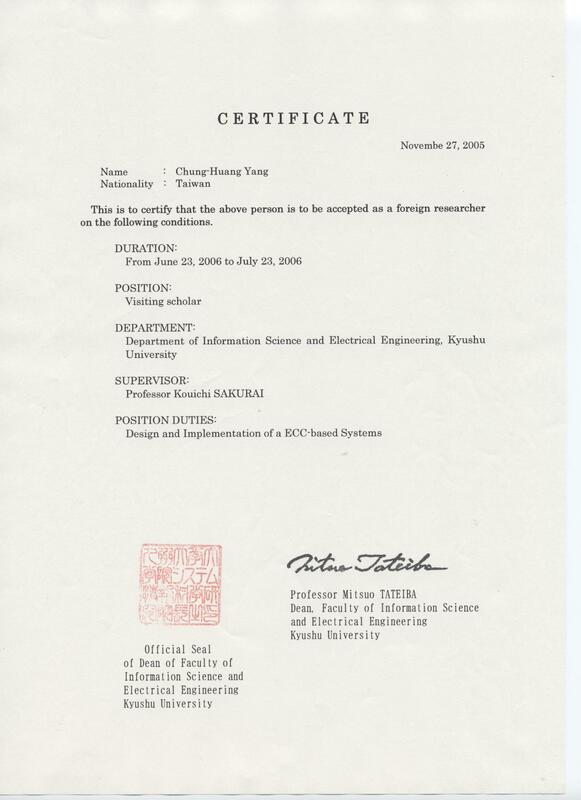 美國路易斯安那大學(University of Louisiana at Lafayette) 電腦工程博士 (Ph.D., Computer Engineering), 1990. 美國路易斯安那大學(University of Louisiana at Lafayette) 電腦工程碩士 (M.S., Computer Engineering), 1986. 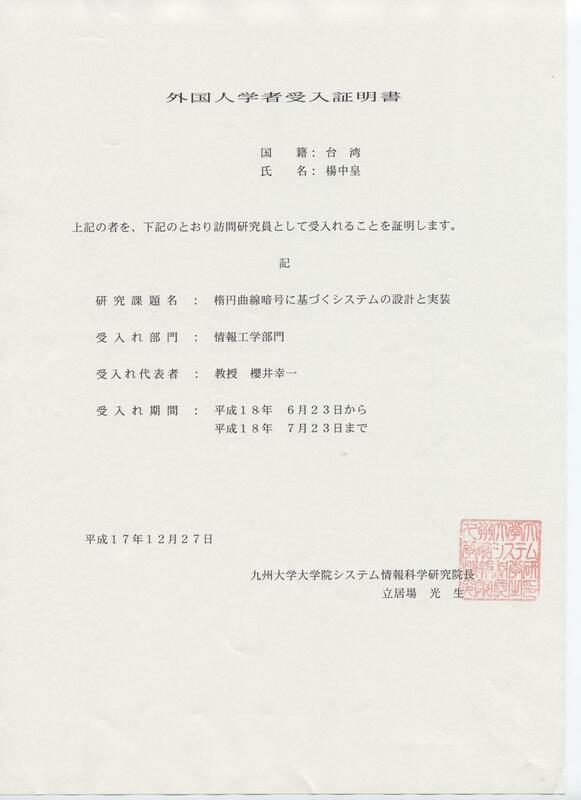 國立成功大學 電機學士 (B.S., Electric Engineering), 1981. Guest Associate Editor, IEICE 2020 Special Section on Information and Communication System Security, IEICE Transactions on Information and Systems. Guest Associate Editor, IEICE 2020 Special Section on Security, Privacy, Anonymity and Trust in Cyberspace Computing and Communications, IEICE Transactions on Information and Systems. Program Committee member, The 14th International Conference on Ubiquitous Information Management and Communication (ACM IMCOM 2020), January 3-5, 2020, Taichung, Taiwan. General Co-Chair, The 2nd International Workshop on Blockchain and its Applications (Blockchain 2019), Guangzhou, China, November 12-15, 2019. Steering Committee member, The 2nd International Workshop on Blockchain and its Applications (Blockchain 2019), Guangzhou, China, November 12-15, 2019. Program Committee member, The 13th International Conference on Provable Security (ProvSec 2019), October 1-4, 2019, Cairns, Australia. Program Committee member, The 5th International Conference on Mathematics and Computing (ICMC 2019), February 7-9, 2019, Bhubaneswar, India. Program Committee member, The 13th International Conference on Ubiquitous Information Management and Communication (ACM IMCOM 2019), January 4-6, 2019, Phuket, Thailand. Associate Editor, Journal of Information and Communication Convergence Engineering (JICCE). 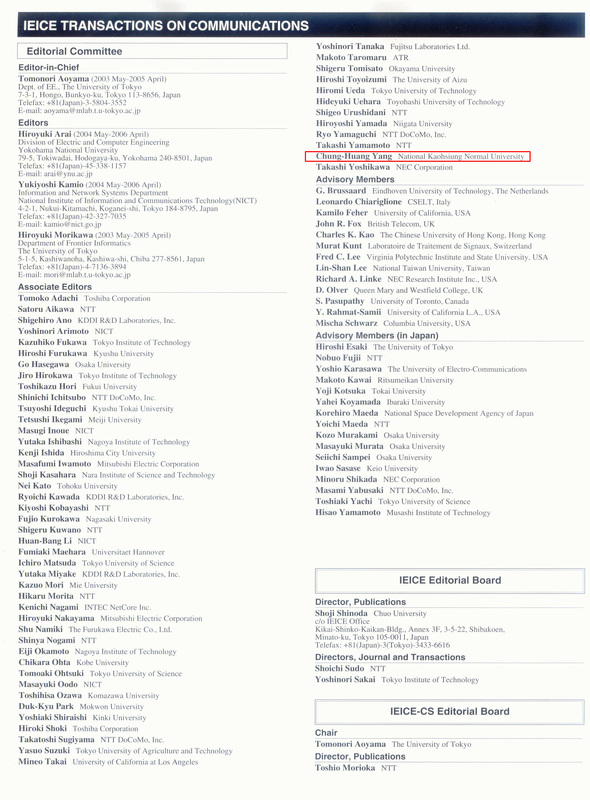 Editorial Board, International Journal of Reliable Information and Assurance (IJRIA). Guest Associate Editor, IEICE 2018 Special Section on Information and Communication System Security, IEICE Transactions on Information and Systems. Program Committee member, The 12th International Conference on Provable Security (ProvSec 2018), October 25-28, 2018, Jeju Island, Korea. Program Committee member, The 2018 IEEE International Symposium on Smart City and Informatization (iSCI 2018), October 12-14, 2018, Guangzhou, China. Steering Committee member, The 6th IEEE International Workshop on Network Optimization and Performance Evaluation (NOPE-18), October 8-12, 2018, Guangzhou, China. Program Committee member, The Sixth International Symposium on Security in Computing and Communications (SSCC'18), September 19-22, 2018, Bangalore, India. Program Committee member, The 13th International Workshop on Security (IWSEC 2018), September 3 - September 5, 2018, Sendai, Japan. Program Committee member, The 12th International Conference on Ubiquitous Information Management and Communication (ACM IMCOM 2018), January 5-7, 2018, Langkawi, Malaysia. 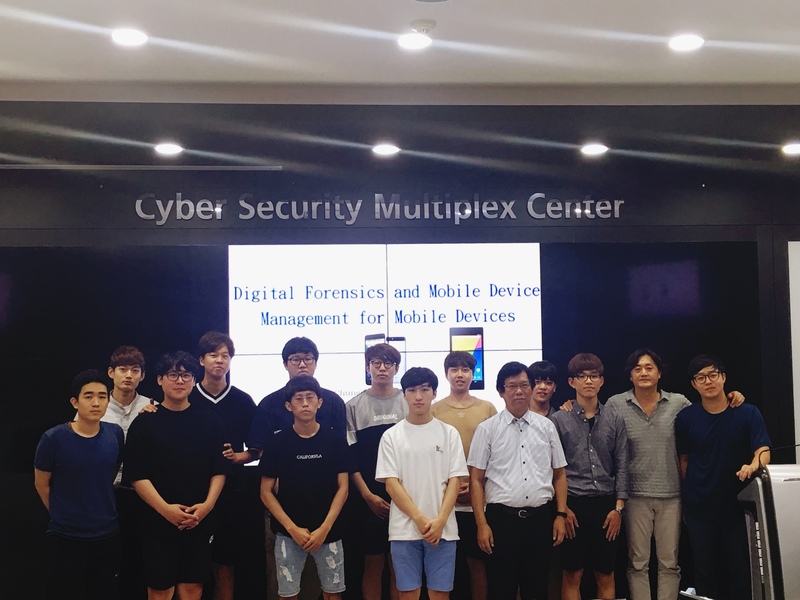 International Co-researcher, Information Security Application & Assurance Laboratory (ISAA), Department of Cyber Security, Ajou University, Korea. Guest Associate Editor, 2017 Special Section on Information and Communication System Security, IEICE Transactions on Information and Systems. Program Committee member, The 11th International Conference on Provable Security (ProvSec 2017), October 23-24, 2017, Xi’an, China. Program Committee member, The Fifth International Symposium on Security in Computing and Communications (SSCC'17), September 13-16, 2017, Manipal, India. Program Committee member, The 12th International Workshop on Security (IWSEC 2017), August 30 - September 1, 2017, Hiroshima, Japan. Program Committee member, The 11th International Conference on Ubiquitous Information Management and Communication (ACM IMCOM 2017), January 5-7, 2017, Beppu, Japan. Guest Associate Editor, Special Section on Information and Communication System Security, IEICE Transactions on Information and Systems. Program Committee member, The Tenth International Conference on Provable Security (ProvSec 2016), November 10-12, 2016, Nanjing, China. Program Committee member, The 11th International Workshop on Security (IWSEC 2016), September 12-14, 2016, Tokyo, Japan. Program Committee member, The 17th International Workshop on Information Security Applications (WISA 2016), August 25-27, 2016, Juju Island, Korea. Workshop Co-Organizer, The 6th IEEE International Workshop on Network Technologies for Security, Administration and Protection (NETSAP 2016), June 10-14, 2016, Atlanta, Georgia, USA. Program Committee member, The 10th International Conference on Ubiquitous Information Management and Communication (ACM IMCOM 2016), January 4-6, 2016, DaNang, Vietnam. Guest Associate Editor, IEICE 2015 Special Section on Information and Communication System Security – Against Cyberattacks. Program Committee member, The 10th International Workshop on Security (IWSEC 2015), August 26-28, 2015, Nara, Japan. Program Committee member, The 16th International Workshop on Information Security Applications (WISA 2015), August 20-22, 2015, Juju Island, Korea. Program Committee member, The 14th IEEE International Conference on Trust, Security and Privacy in Computing and Communications (IEEE TrustCom-15), August 20-22, 2015, Helsinki, Finland. Workshop Co-Organizer, The 5th IEEE International Workshop on Network Technologies for Security, Administration and Protection (NETSAP 2015), July 1‐5, 2015, Taichung, Taiwan. General Co-Chair, The 10th Asia Joint Conference on Information Security (AsiaJCIS 2015), May 25-26, 2015, Kaohsiung, Taiwan. Program Committee member, The 9th International Conference on Ubiquitous Information Management and Communication, ACM IMCOM (ICUIMC) 2015, January 8-10, 2015, Bali, Indonesia. General Co-Chair, The 9th Asia Joint Conference on Information Security (AsiaJCIS 2014), September 4-5, 2014, Wuhan, China. Program Committee member, The 9th International Workshop on Security (IWSEC 2014), August 27-29, 2014, Hirosaki, Japan. Program Committee member, The 15th International Workshop on Information Security Applications (WISA 2014), August 25-27, 2014, Juju Island, Korea. Program Committee member, IEEE SERE 2014 (The 8th International Conference on Software Security and Reliability), San Francisco, California, USA, June 30-July 2, 2014. Program Committee member, The 8th International Conference on Ubiquitous Information Management and Communication (ICUIMC 2014), January 9-11, 2014, Siem Reap, Cambodia. Program Committee member, The 9th China International Conference on Information Security and Cryptology (INSCRYPT 2013), November 27 - 30, 2013, Guangzhou, China. Program Committee member, The 8th International Workshop on Security (IWSEC 2013), November 18-20, 2013, Okinawa, Japan. General Co-Chair, The 8th Asia Joint Conference on Information Security (AsiaJCIS 2013), July 25-26, 2013, Seoul, Korea. Guest Associate Editor, IEICE 2012 Special Section on Trust, Security and Privacy in Computing and Communication Systems. Program Co-Chair, International Conference on Convergence and Hybrid Information Technology (ICHIT 2012), Springer-Verlag Lecture Notes in Computer Science, Volume 7425, August 23-25, 2012, Daejeon, Korea. Program Committee member, The 6th International Conference on Network and System Security (NSS 2012). Program Committee member, The Second International Workshop on Mobile Commerce, Cloud Computing, Network and Communication Security 2012 (MCNCS 2012). Program Co-Chair, International Conference on Convergence and Hybrid Information Technology (ICHIT 2011), Springer-Verlag Lecture Notes in Computer Science, Volume 6935, September 22-24 , 2011, Daejeon, Korea. 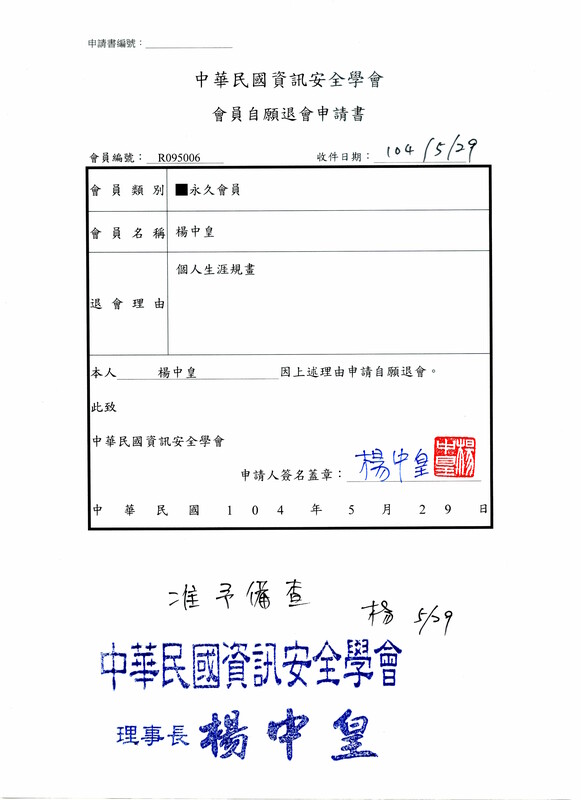 Outstanding Leadership Award 領導卓越獎，Korea Knowledge Information Technology Society 韓國知識資訊技術協會(KKITS). Program Committee member, The First International Workshop on Mobile Commerce, Cloud Computing, Network and Communication Security 2011 (MCNCS 2011). Guest Associate Editor, IEICE 2010 Special Section on Trust, Security and Privacy for Pervasive Applications. Program Committee member, Track 4. Security in Internet Symposium, The 2nd International Conference on Internet (ICONI 2010). Guest Associate Editors, IEICE 2009 Special Section on Information and Communication System Security. Program Committee member, 2009 Joint Workshop on Information Security (JWIS2009). IEICE Trans. 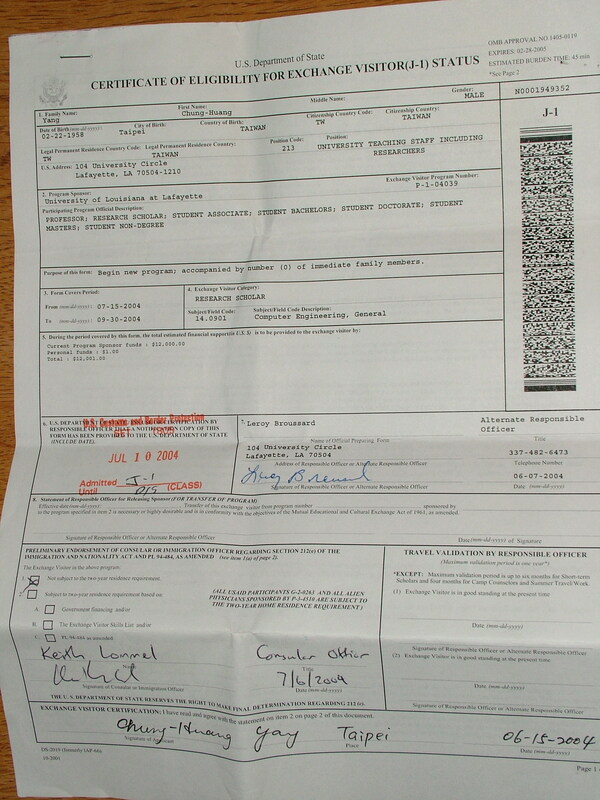 Communications編輯委員(associate editor) (2004-2005).